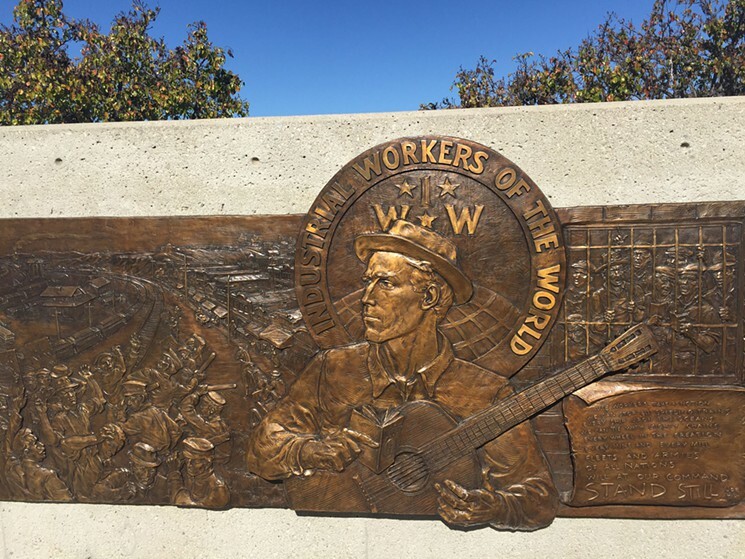 Despite its headline the article is more about the Little Red Songbook than about Joe Hill, but it gives many examples of labor and other movement songs continuing to inspire workers to this day. We have secured several discounted copies of Franklin Rosemont’s magisterial volume on Joe Hill’s legacy, available while supplies last (along with Wm. Adler’s more biographical work). We also have the expanded edition of The Letters of Joe Hill, edited by Philip Foner and Alexis Buss, which was expanded to include the text of all Hill’s surviving songs, letters and articles. Also available, while supplies last, is the 2019 Solidarity Forever Labor History Calendar. This year’s edition focuses on great strikes, from the 1919 general strikes in Buenos Aires, Seattle and Winnipeg to the strikes that brought down apartheid, demanded an end to discrimination in Iceland, and mobilized millions of workers against austerity. Joe Hill’s songs fanned the flames of discontent in the early 20th century, becoming anthems of the Industrial Workers of the World labor union. Hill was executed in 1915 for a murder he probably did not commit, but his music has lived on to influence generations of social and political protest music. Featuring the Shelby Bottom Duo and Q&A with faculty from the Divinity School, and Departments of History and Sociology. Light refreshments will be served. The event is free and open to the public. Closest parking is Wesley Place Garage. Co-sponsored by Vanderbilt Department of Sociology, Divinity School, Department of History, Program in American Studies, and Blair School of Music’s Department of Musicology and Ethnomusicology. Special thanks to the Tennessee Arts Commission. Magpie, the folk duo Greg Artzner and Terry Leonino, wear their working class roots and union memberships proudly. The native Ohioans met at Kent State, where Terry dodged National Guard bullets in the infamous murders of four students in 1970. The social justice and environmental activists began performing together soon after and have never wavered from their strong messages for freedom. When We Stand Together, subtitled Songs of Joe Hill, the IWW, and Fellow Workers, is a noble effort in the history of Wobbly songs. Its broad vision that includes songs penned by Ronnie Gilbert, Tish Hinojosa, and Si Kahn, Phil Ochs, and others closes a circle to incorporate the vision of a world where there is room for the justice around which we organize. Greg and Terry have added an important new take on the singing union tradition of the IWW. Two years ago Magpie signed on to tour with FWs Charlie King and George Mann for the “Joe Hill Road Show,” during the centenary of the Wobbly bard’s execution in Utah. They had already fallen in love with many of Joe’s songs. They were so thrilled, in fact, they took out red cards on the tour, adding to their credentials as stalwarts in AFM Local 1000, the traveling musicians’ local. It’s exciting to hear them lead off this CD with Hill’s “Workers of the World Awaken.” Joe’s reboot to the “Internationale” riffs some of its lines but adapts it to a higher plane. One verse (“If the workers take a notion they can stop all speeding trains,” etc.) outlines the mechanics of stopping exploitation in the workplace and ending war. Magpie’s revelatory attempt here illustrates how their musicianship and sense of history are second to none in modern folk music. Hill’s best efforts expropriated the boss-class popular culture and accentuated themes of “building a new society within the shell of the old,” as stated in the IWW Preamble. Hear Greg and Terry’s spirited offerings on Hill’s “It’s a Long Way Down to the Soup Line” or the anti-war anthem “Don’t Take My Papa Away from Me.” Terry’s vocal on the latter is rich, emotional, and evokes the era in which it was penned. While many have recorded Joe’s “The Rebel Girl,” Magpie treats it with a reverence they share about Hill’s compositional prowess. Magpie’s originals show their strengths as songwriters. “Poor Old Dobbin” is a tribute to the IWW that could have been written a century ago. And “Canton 1918” chronicles the famous speech by Gene Debs that resulted in his lockup in the federal pen for “sedition.” You can hear the emotion coming through your speakers with Greg’s lead vocal as he sings so reverently about the time and the town as it was then. The 19 cuts that grace the recording include songs by many non-IWW authors, but their inclusion enriches the mix. Like Flo Reece’s “Which Side Are You On?” where Terry embodies Flo’s unique vocal style, working-class imperatives in “Build High the Bridge,” environmental justice in “Something in the Rain,” solidarity in “Links on the Chain,” and immigrants and labor in “Borderlines” are all powerful reminders of the work that still needs to be organized. Do you know “Paper Heart”? Si Khan and Charlotte Brody wrote this about Joe Hill, and Magpie’s heart-tugging harmony is sad and beautiful. And now the circle is complete. Please see www.magpiemusic.com for information on this and other recordings by Magpie. Sunday, Nov. 19, 2017. 4:00 pm. Joe Hill commemoration concert with the U-Liners. Fundraiser for Marc Elrich, candidate for Montgomery County Executive. Flanagan’s Harp & Fiddle, 4844 Cordell Ave., Bethesda, Maryland. We’ve also added the 2018 Solidarity Forever Labor History calendar to our web store. This year’s calendar commemorates workers’ struggles against fascism and bigotry around the world, and the power of workers’ solidarity. Workers of the World, Awaken! : The Life and Legacy of Joe Hill exhibit opened on Saturday, June 3, at the Steeple Building Museum in Bishop Hill, Illinois. The exhibit will close on September 30, 2017. This traveling display, consisting of 5 text panels and over 25 stand-alone images with music, was created by the American Swedish Historical Museum in Philadelphia. After a year in Philadelphia, the exhibit has also appeared at Nordic Northwest, in Portland, OR. For more details about the exhibit or the concert, please call 309-927-3899 or email bhha@mymctc.net. Shelby Bottom Duo invites you to attend a free performance of their acclaimed show “A Musical History of Joe Hill & the Early Labor Movement,” Tuesday April 25, 11 am at the UAW hall, 6207 Centennial Blvd in west Nashville, Tenn.
Nashville-based Shelby Bottom Duo (Michael August and Nell Levin) will perform their entertaining, multimedia educational show, A Musical History of Joe Hill and the Early Labor Movement in Louisville April 7. The show is set for 7 to 10 p.m. at Lettersong, 1501 Story Ave.
Tickets are $10 advance, $12 at the door. Space is limited so advance tickets are recommended. Click here for tickets. Songwriter Joe Hill is the precursor of Woody Guthrie, Pete Seeger, Bob Dylan and Bruce Springsteen. He was immortalized when Joan Baez sang “I Dreamed I Saw Joe Hill Last Night” at the Woodstock Festival in 1969. A Swedish immigrant, Hill was a member of the international labor group, the Industrial Workers of the World (IWW or Wobblies), active in the decade leading up to World War I. In 1914, Joe Hill was framed for two murders he did not commit. He was executed by a firing squad in Salt Lake City, Utah on November 19,1915. He subsequently became a labor icon. Our Musical History includes live performances of Joe Hill songs along with a talk and images about Hill’s life, early labor struggles and the influence of the IWW’s innovative organizing strategies on movements today. Our goal is to share this vital slice of labor history with a wide range people so that we can all better understand why the revolutionary creativity exemplified by Joe Hill and the Wobblies is still relevant. In 2015, 100 years after Joe Hill’s execution, 40 concerts were held around the country celebrating his legacy. Shelby Bottom Duo organized and performed at the Nashville concert and performed at the Knoxville concert. A Musical History has received funding for our performances from Metro Nashville Arts Commission THRIVE and Humanities Tennessee. Last Fall, I spoke with Duncan Phillips – the eldest son of the late folk musician and fellow Wobbly Bruce “Utah” Phillips – who I have known since April 2008, when his Dad’s health was in an irreversible state of decline. Duncan had some interesting news. It turns out that the old caboose-like rail car known as a “flanger,” once owned and rehabilitated by Utah nearly 50 years ago in Vermont, had been put up for sale. We both agreed that we must do whatever it takes to acquire the car, that it should serve as the Bruce “Utah” Phillips Library, and that it should be trucked across the country to the place where Utah would have wished it – the Black Butte Center for Railroad Culture in Weed, CA. So, the great news since then is that Duncan has set up a tax-exempt non-profit 501c3 called The Long Memory, and he was able to obtain the rail car! Now we need to raise roughly $25,000 to prepare the car for the move, build a track pad and other onsite infrastructure, rent the cranes to lift/drop it and the semi-trailers to haul it, and then restore it upon arrival to its condition in the early 1970s when Utah first lived in it. Check out the comprehensive website that Duncan has put together, a virtual treasure trove of information, not just about the caboose/flanger and its history, but about Utah Phillips – his life, music, ideas, recordings, wisdom, poetry, writings, radio shows, and more. Take your time, there is a lot to see, listen to and think about. 1 — Make a donation – no matter how small – to help us bring this project to fruition. You can do that HERE. 2 — Post a Blog entry on the Long Memory website, and share any stories, thoughts, and/or reminiscences that you may have about Utah Phillips. You can do that HERE. 3 — (Musicians) Give a verbal plug from the stage for the project (and possibly pass out flyers) at your upcoming shows throughout this year. 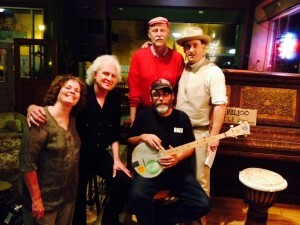 4 — (Musicians) Play a benefit concert in the coming months to help us raise the necessary funds for the transport and rehab of the rail car and to raise awareness of the project. 5 — Join us at the ceremony and celebration this summer at the Bruce “Utah” Phillips Library on the grounds of the Black Butte Center for Railroad Culture in Weed, California at the foot of Mount Shasta (tentatively planned for late summer 2017). 6 — (Musicians) Perform on-stage on the grounds of the Black Butte Center for Railroad Culture at the ceremony/celebration. 7 — Forward this email to fellow musicians, union activists, Wobblies, historians, and supporters of the arts who might be interested in this endeavor. For further information see the website and/or fundraiser. Your support, advice and encouragement is much appreciated!